The Balloon, the Tree and Me – #poetry – #whatdoyousee? 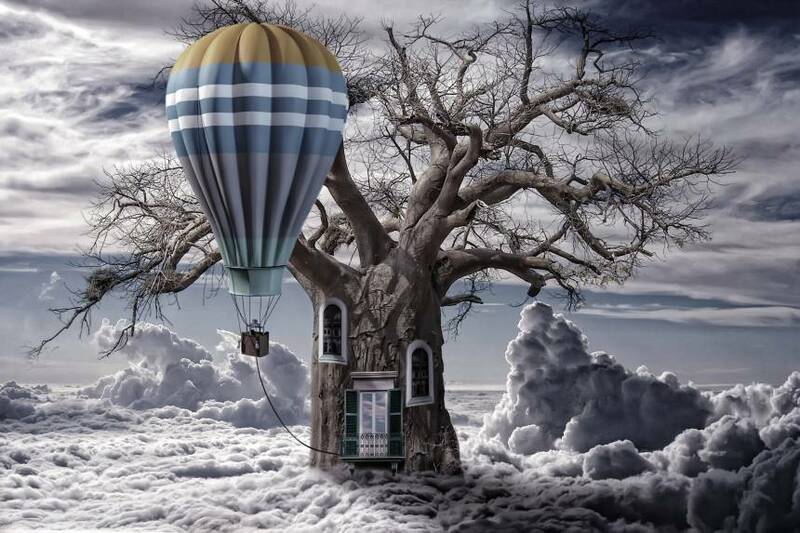 Tethered to a hollow tree, is the only means of escape; above the clouds, above the sea, my visions, to take shape. I’ll prepare some food and pack my gear, I mustn’t take too much; travel light, as I leave here, from home, the things that touch. Take my time getting ready, I can’t rush to make it through; I must remember, slow and steady, yes, that’s what I must do! Check the windows one more time, make sure the lights are off; got my map, but what a crime, should it happen, I get lost. Perhaps it’s what I’d like to do, disappear among the clouds; just my balloon, decked out in blue, far away from noise and crowds. A flight of imagination, to breathe in the air, up here, alone; then finally, because I know it’s there, return to my tree home. Retreat or time out – speaks to me right now. We always go home in the end. Nice take on this prompt. It’s funny how that works. As children, we cannot wait to “get out of here”, and as adults, we cannot wait to go home again. Thanks, V.J. Marvelous poem Dorinda. I love the fact that you can travel in your balloon, away from noise and so on, but you know that you do have a firm foundation to come back to when you want. What a beautiful world that enables such travel. Wow, I really love the whimsy of this! Such vivid description! I want to do that too!